In a consortium of 25 partners in seven countries, this unique European research project allowed Namahn to explore Human-Machine Interface solutions at the cutting edge, with the added benefit of feeding the knowledge and insights into Namahn’s own work for clients. A proactive multi-modal Human-Machine Interface should adapt to context and user state—or even the user’s intentions. Such an HMI would, for example, reduce the amount of information presented to the user when under stress, or choose the appropriate modality for input or output depending upon the context. The HMI could allow voice input if the user cannot use his or her hands as in the case of fire fighters or drivers, use voice instructions if the user cannot see the interface, or even make use vibrations for alarms. Namahn developed two proofs of concept, one in the area of emergency dispatching and one in the area of manufacturing process management. For the emergency dispatching concept, we focused on a system for fire brigades during an emergency response situation. 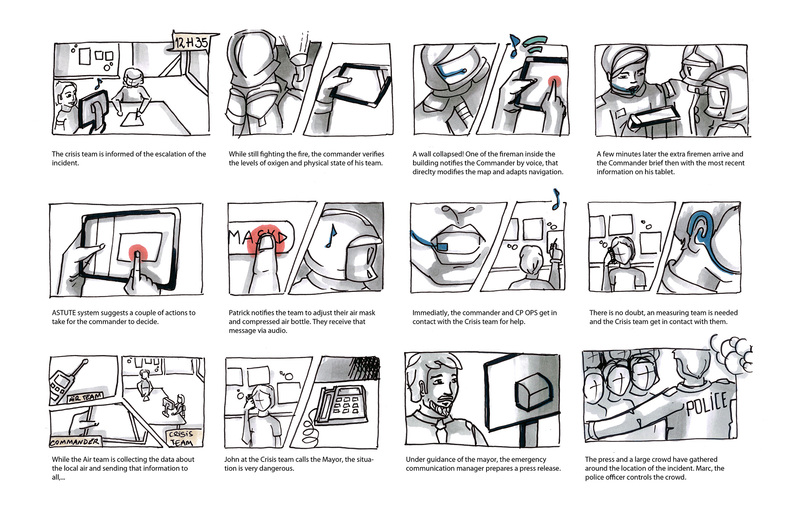 After a period of intensive field study, we developed user scenarios, personas and even developed a storyboard, using a comic strip style to illustrate user interactions with the technology. We also carefully detailed the mental model of a fire brigade commander, making explicit his objectives and de-composing them into sub-objectives. The design patterns we identified captured the main elements of the design in reusable chunks that can be applied in other domains. Together with its partners, Namahn has worked on producing actual prototypes of the system. These include an on-sleeve Android phone for fire fighters, an Android tablet computer for commanders and a computer for the crisis team. The design patterns and usability test methods can also be reused in other contexts or for other projects. Overall, the ASTUTE project has provided an invaluable opportunity for learning.